Q. Why did you change your name? A. A lot of people are asking that! We’re in our fourth decade of this work and if we don’t go for a facelift now, we’ll never have one! Strictly Medicinal Seeds because for us its all about the seeds, and every one of them is medicine–for the soil, for the gardener, for the benefit of all interrelated beings. My wife and myself are not young anymore, although we try to act it, and we will be passing this work on to our various offspring. They have their own ideas about how to promote our earth-friendly activities, their input is important, their happiness is important to us, and if they want an upgrade to the image, well, here we go! Q. Why do I have to make an account to order from you? A. This helps us keep hackers out of our website. We do it for your protection. Log in before making an order. If you have trouble logging in, call us at (541) 846-6704 and ask for INTERNET CUSTOMER SERVICE or e-mail inservice(at)strictlymedicinalseeds.com. Q. How do you process payments and is it secure? A. We use “Authorize.net” payment portal. They are the most secure way to proceed. We never see your credit card number, it is all encrypted and sent through the portal. Your card is charged immediately when you finalize your order. We do have some leeway in refunding all or part of the order if, for instance, you are in Canada and order tinctures, or in Greece and order fresh (undried) seeds that are not available for international shipment. We have set our security settings to “high.” This means you have to present the ccv code for the card, the address must match, and certain ISP’s including Russia and Vietnam are disallowed. If your card does not confirm, and it appears to be an order in good faith, we will contact you for further details, get the payment, and send the seeds. Q. Do you share my information with other websites or any other entities? Q. I wanted to get gardening advice from you and when I called “customer service” they just read me the information from your website. What’s up with that? A. Customer service is not qualified to give gardening advice–please don’t ask–customer service is composed of delightful local people who are experts at processing orders. If you want gardening advice we do have a free service for your convenience. Simply e-mail herbseed (at) budget.net with your question, and you will receive an informed response. Please keep questions concise. Answers, also, will be concise. Limit 3 e-mails per customer. Q. How fast do you ship out orders? A. Simple seed, book, and dried herb orders generally ship out in 3 to 5 days. This means you get your stuff, on the average, 7 to 10 days after you make your order. International orders will take longer to get to you. If you want us to turn it around as fast as possible, put the words PLEASE SHIP ASAP in the customer comments field at checkout. This will help immensely. Orders for Comfrey are shipped year-round, usually taking 1 to 2 weeks to ship. Sometimes winter comfrey orders will be delayed due to frozen fields. Orders for other live roots (Goldenseal, Black Cohosh, Bloodroot, Wild Yam, etc.) ship in 1 to 2 weeks if you order during late September to December, otherwise are backordered to the fall shipping season. Plants are shipped April 1 through Aug 1, then again Sep 1 through Jan 1. If ordering out of season, plants will be backordered and shipped in season. 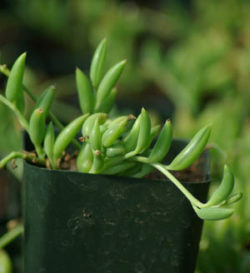 If ordering in season, plants usually ship in 1 to 3 weeks from the time of your order. If you have a preferred timeframe, please let us know, we will try to comply. If you need plants quickly, let us know and we’ll try to put your order up for monday of the next week. That is about as fast as we can turn it around. Q. Can I get RUSH service. A. You can, and we will apply a $10.00 rush charge and use your shipment method of choice (FedEx, Express mail, UPS 2-day, etc.) Rush orders usually ship within 24 hours. Please call customer service at (541) 846-6704 to arrange for rush delivery. Q. I ordered over $100.00 of seed packets and I’m a farm. Can I get wholesale? A. Actually, we are already providing packets farm-direct to the end user at rock bottom prices. Strictly Medicinal does have wholesale accounts–seed racks in stores–if you think you might qualify for this program, please contact us at wholesale(at)strictlymedicinalseeds.com We define “wholesale” differently from “discount.” Wholesale terms are for resellers that have brick and mortar stores and resell packets to the public. Folks looking for a discount can look into our seed sets, seed collections and bulk purchasing discounts (such as buying 6 comfrey roots instead of 1, or buying 3 plants instead of 1) all of which are nicely discounted. Q. I ordered a goldenseal plant in April and received it in good shape. However, in July it died. Can I get a refund? A. No. Goldenseal (and many other herbaceous perennials) has an aerial cycle and a dormant cycle. Just because the aerial parts died back does not mean the plant is dead. Check the roots and you will see that the root is still lively. Regrowth is in the spring. And, no, we do not give refunds or replacements on plants that die under your care. We guarantee receipt of a live plant and it is up to you to keep it alive. Here is a link to our TERMS OF BUSINESS. Q. What is the difference between the wording “organic” and “certified organically grown” on your website? A. None, anything that has the word “organic” or “organically grown” in the description is certified organic by Oregon Tilth and is NOS compliant. Q. 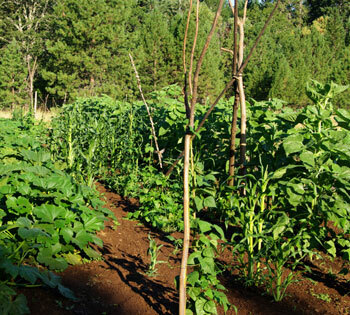 Are all of your seeds and plants certified organically grown? A. No, but everything we grow ourselves is certified organic, and we are organically certified processors, which means we can buy organic seed from other growers and sell it as organic. On the whole, organic is our focus, and with a very few exceptions all of our nursery plants and trees are organic, and the majority of the seed we offer is grown by us and organically certified. Any wild carafted or commercial seed we do carry is guaranteed to be untreated (in other words not dipped in some wierd fungicidal or insecticidal chemical) and open pollinated (in other words not a hybrid type), and definitely not GMO’d (genetically modified). We do carry one hybrid in the catalog, which is russian comfrey. Q. Are all your seeds heirlooms? A. Not really. Heirloom generally means an old-timey type that has been handed down from generation to generation. Many of our seeds do fit this definition, but many are wild plants that have been recently domesticated (not heirlooms). We would rather focus on OPEN POLLINATED plants (seed saver friendly), organic, untreated, no GMO’s, and LOVE. Q. Do you ship international packages by sea? A. No, we ship international packages by air mail. Q. I planted your Echinacea seeds and I got purslane instead. What’s up? A. Please rest assured that we properly package and label our seeds. If it was purslane seed (very tiny seeds) instead of Echinacea seed (larger, very characteristic shape) from the start, don’t you think you would have noted this during planting? Sometimes people think we sent them the common weeds that germinate quickly after planting, but these common weed seeds were already there in the soil. The seeds that you purposefully plant are often slower germinating flowers, but they are worth the wait! We have a 3 point GMP verification system to make sure that seeds are not mislabeled. If you truly believe you got nongermination on a packet, and the appropriate germination time has passed, just call or e-mail us and let us know, and in most cases we’ll immediately send you a free one time replacement, no questions asked. 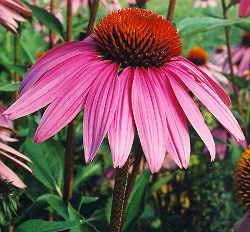 There are a few rare varieties (e.g. Mandrake) that are not guaranteed and which we will not replace. This is noted in the catalog. All of our seed is germ tested. All of our seed is viable. One of the challenges involved with carrying a lot of wild type seeds and unusual or rare plant seeds is–difficulty in germination. So please, work on the planting method, prepare the right environment, and excercise patience and faith. It matters. Q. Do you make the “Herb Pharm” tinctures that you sell? A. No, Herb Pharm is an herbal manufacturer that operates in the same town where we live. Richo was the production manager at Herb Pharm for 11 years and helped develop many of their formulas, and wrote their “good manufacturing practices” which help assure that their products are correctly identified, potent, and of highest quality. When you order a tincture from us, we go to Herb Pharm and pick it up (fresher than what you can get from a store), and pack it and send it to you. We sell herb Pharm products at a 5% discount from the regular retail price. Q. Do you manufacture your own herb drying screens and seed cleaning screens? A. Yes, and we love this aspect of what we do. Tools for sustainability, that’s what its all about! Q. 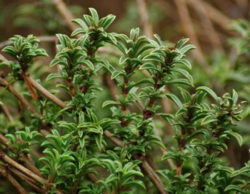 Do you grow the dried herbs that you sell? A. Yes, and they are organically certified, hand picked, dried and packaged with great care. 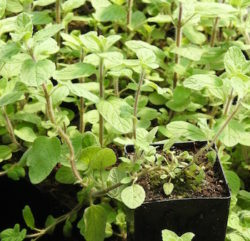 We really love growing and selling dried herbs, although it is a very small part of what we do. We make sure that the herbs we sell are extraordinary. Such things as dried Comfrey, Hawthorn Berries, Elderberries, Rosemary, etc.–all these things are grown and processed right here. We also sell spices (Cinnamon, Black Pepper, Cloves, Vanilla, etc. ), which are grown in Pemba by people we know and trust. Talk about “fair trade,” this is a situation where roots organic farmers are selling their stuff to a reseller who gives them WAY more profit margin than they could get anywhere else. We really enjoy supporting them. We’ve shortened the supply chain to give everybody a better deal. We also sell “Herbs India” dried herbs which are really great. The “Tulsi Tea” they produce is something we put into our bodies every day, and frankly we recommend that everybody else do this, as well. Its because we want you to be whole. Anyway, such things as “triphala” formula, Neem leaf, Shatavari, etc. 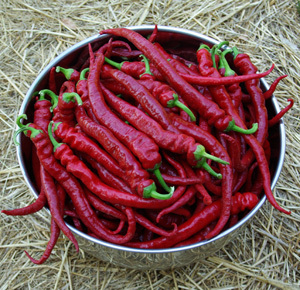 are not realistic for us to grow here, and Herbs India does a great job, organic, and at a very reasonable price. I’ve always thought any enterprising local tincture manufacturer could make a living simply by reconstituting the Herbs India herbs in alcohol. Q. I have a terrible cold. Can you recommend something for me to take? A. Sorry, no, we cannot give medical advice. We can talk about herbs and what they do, we can relate the folklore, we can site recent scientific studies, we can talk about our own experiences with herbs, but we are not doctors, herbal or otherwise. Please consult your health professional for any medical needs. Q. Do you offer an herbal apprenticeship program, work trades or internships? A. Sorry, no, our primary focus here is to grow seeds and plants and disseminate them to the people. We have tried apprenticeships in the past, and this shifts our emphasis to educational, and we no longer offer apprenticeships. The “Herb Pharm Herbaculture” program is a nearby apprentice program in growing, utilizing and understanding medicinal herb farming and use of medicinal herbs in a pragmatic framework. We recommend that program, and there are many other educational entities out there these days, as well. Bastyr. NCNM. Q. What is the shipping on a packet of Chinese Balsam seeds sent to Chechnya? Q. How long do your seeds last in storage and how should I store them for later use? Q. What’s the difference between true comfrey and Russian comfrey? A. True Comfrey (Symphytum officinale) is an open pollinated type that originates in Europe. It has white to purple flowers (our type has dark purple flowers) hollow stems, prickly leaves and a dark brown to black taproot that is filled with mucilage. It makes viable seeds. Russian Comfrey (Symphytum x uplandicum) is a hybrid cross between the russian plant Symphytum asperrimum and Symphytum officinale. 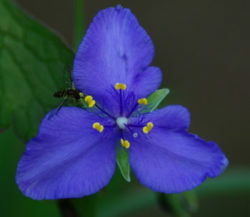 It has pale violet flowers, makes long, broad leaves, and has a brown taproot that is filled with mucilage. It is sterile and spreads only when its root system is disturbed or if it is dug up and propagated by root division. Both types of comfrey are useful in herbal medicine, veterinary medicine, as an animal food, in composting, and in permaculture. To split hairs, true comfrey is probably a little better to use in human medicine, and russian comfrey is probably a little better to use as animal feed and in compost making. 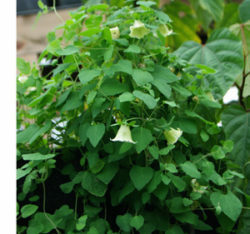 FDA has issued warnings that these plants should not be taken internally, due to presence of Pyrrolizidine alkaloids. Both these types of comfrey contain the cell proliferant molecule known as allantoin as well as pyrrolizidine alkaloids. Extended use of these plants is not recommended–they are best used in human medicine as treatment for acute symptoms, not as a tonic. And, neither type is appropriate for use during pregnancy. Q. My Ashitaba plant grew great this year but now its getting leggy and making flowers. I never harvested the leaves. Is my plant going to die? A. More on how to harvest, consume, and collect seed from ashitaba: The young plant is going to keep making leaves from the center of the crown or stalk. As these leaves mature they begin to go yellow and die back, with new green leaves coming on from the central growth points. 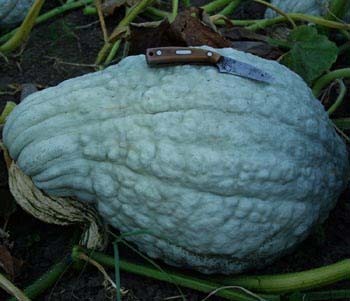 The mature leaves are best harvested and used before they get rubbery. Eat the fresh stems daily. Eat the leaves, too, if you like. Or, dry the leaves and make them into tea or tincture (1:4 50%A 50%W). The plant is monocarpic–it is going to grow and make leaves on an ongoing basis until it flowers, and after making its seeds, it is going to die. If you want to keep the plant for another growing cycle, cut back the tops as they begin to bud and the plant will probably go back to vegetative production (stop making flowers). If not allowed to make flowers, it will probably overwinter and give another burst of production the next year. Bring in for the winter in zones 6 and colder, otherwise mulch the crown and look for emergence of new growth in spring. If you let the plant go to flower and want to harvest seeds, be aware that the plant takes about 3 months to produce mature seeds. Wait until the seeds start to turn brown and begin to split apart. At this point you can harvest the umbel, dry it in the shade, and gently tease the seeds apart, freeing them from chaff. 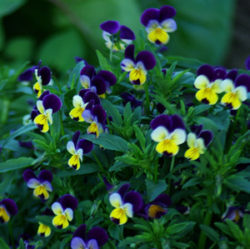 Store in cool, dry shade (in a paper packet in a sealed glass jar in the fridge, or in a dark cabinet) for the winter, and plant in the spring. Q. Why do the white sage seeds have a much different picture than the white sage plants? 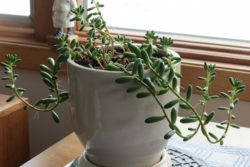 Is this the same plant? A. Yes, the various pictures of white sage (Salvia apiana) do indeed reflect the plant, which will have greenish leaves when young, white leaves when older, droughted, stressed, or later in the season, and in all respects a variable leaf shape and color depending on age and season. The one thing that does not change is the fragrance, which, to the initiated, is unmistakable. A. Bodhi trees are fairly resilient when they get cut back, and tend to throw multiple stems, both if cut back to the base or if pruned on the hardwood. It can make them bushier if you judiciously make a few cuts. It doesn’t really hurt them. Sometimes you can even get the cuttings to root, which is pretty cool when it happens. Sometimes bodhi trees get topheavy, in which case they should be staked. Q. I wanted to clarify a detail of Spilanthes with you. I ordered the Spilanthes Alba for the purpose of buzz buttons for culinary use. Just noticed you have an “official” variety as well, and I’m curious if the Alba I ordered has the “tingling” buzz effect. Also, is one variety superior/stronger over the other in delivering the buzz effect? Any insight you can share with me would be greatly appreciated. A. Thanks for such a nice note. I love the idea of using spilanthes in culinary arts! The original form of spilanthes is the alba, which has yellow buzz-buttons that are equally as tingly as the newer cultivar which we call “official” just because it was the one that we first started using in medicinal applications during the herbal renaissance of the 1970s. They are both great! If you’re after the one with the most visual appeal, I’d choose official, which can have a purplish leaf and flatter, bi-colored buttons. Q. I’ve been using the Amekron metal identification tags that I got from you, which have been working well. I’m looking to start getting into some larger, easier to read, and more durable identification signs. I’d like: self supporting, metal (permanent), affordable. Do you have any suggestions about strategies or products related to this topic? A. I know what you mean. I’ve often wanted something of that sort. I’d add “mowable” to your list. But none of them are. You know in the back of lots of the bigger seed catalogs they sell tons of stuff like that. stick-in markers. otherwise you have to have them fabricated out of metal and the names routered out of formica or some such, and it gets spendy. I personally have gravitated to pounding in a large cedar stake and drilling through the corners at the top and hanging impresso tags from that, identifying whatever plants are in the row (or with the way I garden, “in the vecinity.”) This has worked best for me. The stakes also keep the hose from running up over the bed which I find particularly annoying. Q. Why don’t you sell Anchusa officinalis, Goat’s Rue, Poison Hemlock, Woad or White Bryony anymore? A. 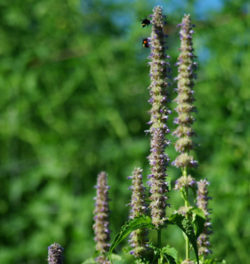 These are all listed as noxious weeds by Federal or Oregon State Department of Agriculture, and they have stepped in to disallow us from selling seeds or plants of these herbs. We’re very sorry about that! Q: It is my understanding that all Schisandra Chinensis need a male & a female plant to bear fruit. Can I get both from you or are you plants the Eastern Prince cultivar? A: Our Schisandra chinensis are unsexed 2-year-olds grown from seed. We suggest planting 3 to a post for best performance and most likelihood that you’ll have both sexes represented. Seed grown individuals are not the same as a named cultivar, which perforce must be grown from cuttings (cloned). Its just good-ol schisandra that makes the schisandra berry of commerce. It is known as the species plant. 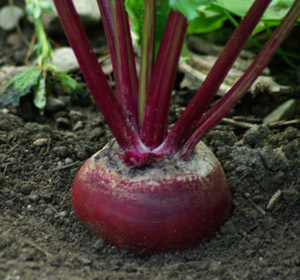 Seed grown individuals have a taproot and are really a better plant than cloned plants. Q: What would the most simplest steps be to getting started in growing? I have a “Gardening Bible” for the west coast, but my tendency is to read EVERYTHING I need to do, in an attempt to prepare. Rather, I end up in “paralysis by analysis” and never do anything. So what is “square one”? How do I “just get started”? A: This is a very insightful question and I often suffer from the same quizzical malaise. What I’ve found helps is “dirt first.” First you make good compost and learn to make good potting soil with it, and the rest will follow with good success. If you don’t have that soil foundation, all efforts can tumble and fall. After good compost, one gets a wheelbarrow and a screen and a shovel and goes after it, beautifying one little spot at a time. I choose the worst junkpile and clean it up and plant flowers there. Q: We got medicinal calendula seed from you a few years ago and have been collecting seed each year to replant. Is there any diminishment of potency in the flowers so long as it’s not cross pollinating with anything? I’m thinking how we need to get new seed each year for some produce. Is it not the case with calendula and how do you know what type of plant it might be a concern with? A: Thanks for that well-considered question. The problem that can occur in this situation is called inbreeding depression. This happens when minimum population numbers of outcrossers like Calendula and a lot of other Asteraceae are not met. You should be working with 2,000 individuals to keep the genepool diverse. Otherwise yes you can get diminished vigor that might equate to diminished potency of the flower. I have definitely seen this happen in Calendula, a breed that seems particularly sensitive to selective influences. It would be a good idea for you to replenish your genepool avery couple of years with a new purchase, and that would be good for us, too! As for the second part of your question I would be unconcerned about inbreeding depression when collecting seed of self-fertile plants like most of the Legumes or Solanacea. Q. What is it with the mouse? A. Cheesie is our mascot. She was a real mouse that exhibited extraordinary abilities who met an untimely end when a vet overanaesthetized her on the operating table (she had developed a tumour), and has been immortalized by Sena, the “Mouse Picasso.” The first cheesie illustration ocurred in pencil on the moulding of Sena’s upstairs loft bedroom. Instead of scolding her, we encouraged her to do more. It was one of those Y’s in the road that could have dumped the kid into the pond of frozz, but instead led her to a cliff among the clouds, and then–she flew! Like most mice, Cheesie has spawned many generations of offspring, and you can follow their exploits in the catalog and in our books. There are often subtle (or not so subtle) story lines involved, which are thematic or in some way reflect actual life experiences of various members of our family or work team. Illustrations are drawn with fierce speed by a steady hand. Long live Cheesie the Mouse! En garde!